It appears that brown is the new green. The Denver Zoo has decided to make use of all that primo animal poop that comes out of its residents and convert it into fuel. Now you can tour the zoo (and enjoy a frozen margarita) with the aid of this poo-power. The Denver Zoo has been working for eight years to develop a method for converting animal waste (as well as human trash) into an alternative fuel system. The waste is gasified, thermally converted from biomass to biofuel, and converted into useable fuel pellets. Although right now they only have this single tuk tuk, or automatic rickshaw, the zoo plans to expand their use of this energy across the campus. The hope is to convert 1.5 million pounds of waste each year, and thereby offset 20 percent of the zoo's energy consumption. The zoo would also save $150,000 a year in waste hauling costs, even after the increase in manpower to work the new energy system. 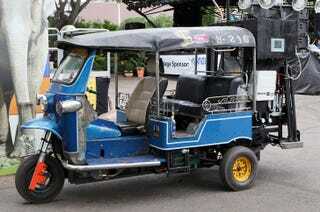 The tuk tuk is actually the zoo's second prototype employing this energy system. The first was a blender used to mix margaritas at a zoo event. Poop-powered beverages just didn't have quite the same appeal.